Here's a good site to get your Company set up and a registered Agent in the State where your new Studio is located. If you just want to make games and give them away, you probably don't need what's in the Kit...but if you are serious about making and selling your own games you have to be serious about making your own game studio. And that is a business venture. The first thing you need to understand before you try to sell that first game is that you can't sell what you don't own! So, you will need to obtain ownership of all of the assets in your game. And under the law in most countries, including the US, intellectual property ownership can not be conveyed unless it is done in writing. The Kit provides the basic legal tool you need to get that done, a Contributor Agreement. A contract of that nature would normally cost over a thousand dollars, even when done by an inexperienced local attorney. The Contributor Agreement in the Kit was prepared for you by an attorney with many years of game industry experience and alone is well worth the cost of the entire Kit. But there is a lot more to the Kit than just the Contributor Agreement. 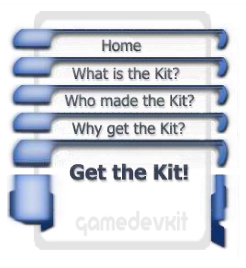 The Kit has sections dealing with the why and how of forming your own game company, communicating with third parties and the appropriate times and ways to use unilateral and mutual Non-disclosure agreements with the NDA's included, a basic primer on copyrights and why and how to obtain them, complete with the forms from the Library of Congress, and links to some of the best sources for information on development, including technical, artistic and business matters as well as the entire series of articles for start-up developers from the creator of the Kit, Game Attorney Tom Buscaglia. Quite a package and quite a deal for under $300 - less that the cost of one hour of a competent attorney's time! Take some time to look around this site and learn more about What's in the Kit, Who Made the Kit and Why you should Get the Kit. Then, if you agree that this is the best deal around for any start-up game developer who wants to get started in the game industry...you too can Get the Kit! of Attorney Time from the Game Attorney! That will save you $1,000.00!